As a creative person with an arty flair and a love of all things personalised I adore clothing and accessories that are adorned with artwork or are personalised…..or even better a combination that is creative, unique and personalised. To quench my love of personalised goodies and custom clothing creations I have found a superb company who offer t-shirt printing including personalised, custom and community designed t-shirts and hoodies on demand - Spreadshirt. Spreadshirt are the masters of personalised and creative clothing and one of the world’s most successful print-on-demand ventures. Thanks to Spreadshirt who offer quality prints on top-of-the-range products I can create my own custom personalised t-shirt or buy from a design community that boasts a wealth of unique and creative designs covering themes and styles such as geek, quotes, funny, hen or stag, sports and hipster. With Spreadshirt I can make creative clothing and give them the personal touch by using the t-shirt designer to personalise my own t-shirt; choosing from thousands of designs or my own images and custom text as I let my creative juices flow to create an unique and special item of clothing. Not only can I get creative with clothing such as t-shirts and hoodies but I can also get personal with custom gifts such as mugs and smartphone covers which make for ideal personalised presents!! If I want to spread my creativity to a wider net than just friends and family who I can gift my personalised creations to, I can use Spreadshirt to cash in on my creative clothing designs too. Using the sell tool that Spreadshirt provides to creators I can easily without cost (it’s completely FREE) upload my designs and open my very own custom online shop or sell my creations on their global Marketplace. Whilst I love all the creative outlets and personalisation service offered by Spreadshirt and the colourful, unique and varied designs they offer thanks to the design community, I really appreciate Spreadshirt’s ethics and values. They care about responsibility to the environment and produce environmentally-friendly t-shirts, are fair and honest, use suppliers that are responsible and abide by an ethical code of practice. Most of all I love how they are passionate about helping people use clothing to display one’s personality, creativity, art and design. 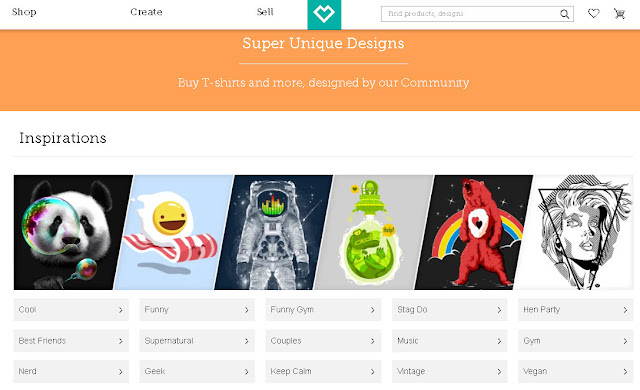 Spreadshirt is an online portal that enables people to express themselves and their creativity. How would you personalise a t-shirt?